Reading The Palace of Illusions felt like seeing the ocean for the first time. It’s beautiful and vast and awe-inspiring. It’s unexpected and unforgettable. And it beckons with the promise of undiscovered worlds beneath the surface and over the horizon. It changes you. The Mahabharat tells the story of the conflict between the Kauravas and the Pandavas, two rival branches of the same family. The dispute is essentially a battle for succession of the throne of the Kingdom of Hastinapur. The scope of the Mahabharat, its multi-generational timespan, its stories nested within stories, and its enormous cast of divine, semi-divine, magical and human characters is unequalled in Western literature. The closest comparison would be the Iliad and the Odyssey by Homer, except that the Mahabharat is ten time longer than both of them combined. I won’t even try to give a synopsis of the Mahabharat. There’s no way I could do it justice. But I do want to highlight a couple of key events in the story that will help set some context for The Palace of Illusions. The Kauravas are led by Crown Prince Duryodhan and his 99 brothers. Yes, ninety-nine. Closely allied with the Kauravas is Duryodhan’s best friend, a warrior named Karna. The Pandavas are led by five brothers and their mother, the matriarch Kunti. The most famous of the brothers is Arjun, the greatest warrior of his time. In the midst of this drama, Drapaud, King of Panchaal, holds a swayamvar for his daughter Drapaudi. Meaning “my husband”, a swayamvar was a ceremony at which a young woman would choose her husband from a group of suitors. In Drapaudi’s case, the suitors were required to complete a task: they had to string a great steel bow and then shoot an arrow through the eye of a metal fish hanging from the ceiling while looking only at a reflection of the fish in a pool of water below. Most of the suitors, kings from other lands, cannot not even string the bow, but Karna does. But before he can shoot his arrow, Drapaudi rejects him due to his low-caste birth. Arjun succeeds in shooting his arrow through the fish’s eye and, as is the custom, immediately marries Drapaudi. Karna, humiliated, develops a life-long animosity towards Drapaudi and the Pandavas. When they return home, the Pandava princes announce to their mother Kunti that Arjun has won a competition. She’s cooking at the time, inside a hut, and without looking around to see what Arjun has won, she tells him to share his prize equally with his brothers. Thus, Drapaudi becomes the wife of all five Pandavas. There are plenty of examples of polygamy in literature, including the Bible, but I’m not aware of any other books featuring polyandry, let alone unapologetically as such a pivotal part of the story. Very broad-minded! The struggle between the two family branches culminates in the Kurukshetra War. Before the battle begins, Arjun despairs of the violence and death the war will cause among people who really should love each other. Krishna, serving temporarily in the humble role of Arjun’s charioteer, encourages him to fulfill his duty as a warrior and to uphold Dharma (meaning, very roughly, righteous living). This conversation between Krishna and Arjun is apparently the most philosophical and the most famous part of the Mahabharat. It is called the Bhagavad Gita. The Palace of Illusions is the story of the Mahabharat told in the first person by Drapaudi. In the original, she is fire-born, beautiful, head-strong and vengeful; a controversial character. In The Palace of Illusions she is no less so, but we read her thoughts and reflections and perhaps understand better the reasons for her actions. The book seems to preserve all the main events of the original story, with a couple of alterations. The first change is that Chitra Divakaruni imagines an undeclared and unfulfilled attraction between Drapaudi and Karna, two traditionally antagonistic characters. This is a daring and dramatic departure that casts much of the Mahabharat in a new light. Despite having five husbands, Drapaudi actually loves Karna above all. We read of her longing for him and of her regret that she has spoken or acted in ways that have hurt Karna. Even more, she regrets that her words and actions have helped bring about a war. Still, at key points in the story, anger and pride prevent either of them from showing even a little kindness towards the other. And only when it is far too late does Karna give any indication that he might have feelings for Drapaudi. Second, just before the Kurukshetra War begins, Drapaudi is given a boon by the sage Vyasa enabling her to witness, as though present, critical parts of the fighting from a safe distance. Through her eyes, we see the eighteen-day war and its terrible, tragic devastation. We see Krishna driving Arjun in his chariot across the battlefield, counseling him to do his duty. We see warriors who pledged to fight with honor resorting to dishonorable tactics in the heat of battle. I believe the events are unchanged from the original, but Vyasa’s gift is an artistic invention by Divakaruni that enables Drapaudi to narrate the war for us. Lastly, there’s a lot of foreshadowing in The Palace of Illusions. As Drapaudi tells the story, she frequently refers to events, usually deaths, that will occur later on. There’s so much foreshadowing that I found myself reading the book with growing dread. Perhaps Divakaruni foreshadows so much because she anticipates most of her readers will already be familiar with the story. Even if they haven’t read all of the Mahabharat, they’ll have read parts of it, or read abridged versions, or heard stories from it told by parents or teachers, or increasingly, they’ll have seen film or television adaptations. Possibly Divakaruni is reassuring her readers that even though Drapaudi’s viewpoint may be different, the original story line is still being followed. I was not familiar with the story, so there could be other differences or nuances that I completely missed. One of the main themes of the book concerns the role of women. That’s one of the reasons, I suppose, for telling the story from a woman’s viewpoint in the first place. On the one hand, Drapaudi is treated like property, married off by her father to the Pandavas to advance his own political aims. Then she is forced to marry all five of the brothers. At one point, her enemies attempt to strip her naked in front of the entire Court of Hastinapur. Her husbands are powerless to help her, but she is spared humiliation by Krishna who intervenes to cause her sari to become infinitely long. Yet at the same time, Drapaudi is well-educated, an astute observer and a keen strategist. Her husbands seek out and follow her advice. She’s an effective Queen. In the book we see her as a complex, capable and multi-dimensional character struggling with forces beyond her control. This leads to another significant theme, for me anyway: the idea of destiny. In the West, most people believe in free will, in making a difference and, more recently, in having a growth mindset. In other words, we believe in the idea of agency – that we are the agents directing the course of our own lives. In contrast, as a young girl, Drapaudi is told that it is her destiny to bring about a great war in which “a million women will become widows because of you.” At the end of her life, as she lies dying on the side of a mountain in Northern India, Krishna appears to her and tells her, “You did what you were supposed to do. Played your part perfectly.” But if that was her destiny, could she have done anything else? Could she have avoided humiliating Karna at the swayamvar, for example? Did she have any choice? Or would her choices have made any difference? In The Palace of Illusions, and presumably in the Mahabharat too, destiny, the idea that we are just instruments and someone else is playing, seems to be accepted by the characters as a fact of life. The notion that we can change our destinies is thus an illusion, and perhaps we construct entire palaces of such illusions over our lifetimes. My own beliefs are strongly tilted towards individual agency, so the dichotomy in the book between destiny and agency really challenged my worldview and has made me reflect on it more. I enjoyed The Palace of Illusions immensely. It was my first in-depth exposure to classic Indian literature. I don’t know if I will ever read the original Mahabharat in full, but The Palace of Illusions opened my eyes to an incredibly important and influential part of Indian culture that I had been totally ignorant of until now. I’m looking forward to learning more. Trust is like engine oil: when it’s present everything runs smoothly, but when it’s not they grind to a halt and quickly catch fire. Much of modern life would be impossible without trust. Without it you would never drive your car because you couldn’t be sure the other drivers would stay in their lanes. You’d never, ever get on a plane. You’d have to grow your own vegetables, otherwise how could you be sure they’re safe for you and your family to eat? And online shopping? Forget about it! Consciously or not, we make decisions to trust people and machines and systems hundreds of times each day. But what exactly is trust? How do we make these trust decisions? And how is technology helping to enable new forms of trust? Rachel Botsman explores these questions in her book, Who Can You Trust? How Technology Brought Us Together and Why It Might Drive Us Apart. Botsman is a writer, researcher and lecturer at Oxford University’s Said School of Business. The book is incredibly timely. These days it seems like more and more of the people and institutions we used to trust can’t be trusted anymore. Nobody ever trusted Wall Street much, but during the Great Recession, banks, mortgage lenders, credit rating agencies and government regulators all betrayed our trust. Politicians and journalists, priests and bishops, drug companies and oil companies have all joined the rogue’s gallery of the untrustworthy. Yet at the same time, it’s become normal to get into cars with strangers, invite strangers to sleep in your home, and hire strangers to babysit your kids. As Botsman says in her TED Talk, we’ve stopped trusting institutions and started trusting strangers. Why? And how? Botsman defines trust as “a confident relationship with the unknown.” When we decide to trust something or someone, we’re making an assessment of how likely it is that some future outcome will be favorable to us. Trust operates at three levels: local, institutional and distributed. Local trust is the kind we’re most familiar with. It operates within small, local communities, among people we know. Institutional trust is trust that flows vertically through intermediaries such as governments, corporations, universities, courts and regulatory bodies. We tend to trust leaders, experts and brands (at least we used to) because of their position or association with these intermediaries. Distributed trust flows horizontally between individuals mediated through systems, platforms and networks. The entire sharing economy, from rides to rooms, is built on distributed trust. In recent years we’ve seen a massive shift away from institutional trust towards distributed trust. Botsman suggests three reasons why institutions have lost our trust. The first cause, she says, is an asymmetry in accountability. During the Great Recession, thousands of people lost their homes, and millions saw their retirement savings decimated; but governments bailed out the big banks and not one of their executives went to jail. Second, organizational hierarchies have flattened, reducing the distance (although certainly not the wealth) between the elites and everyone else. Lastly our community has fragmented into homogeneous “echo chambers” that exclude people we don’t like or don’t agree with, regardless of whether they hold some position in an important institution. How do you decide to take a risk and try something new? The first time you typed your credit card number into a web page, you didn’t know how things would turn out. Your confidence might have been low. Maybe it was of a leap of faith, or rather a leap of trust. So how do you decide when to make a trust leap? Botsman says we do this by climbing the “trust stack.” We first have to trust the idea, new though it may be. Then we have to trust the platform it’s built on. Lastly, we must trust the specific individual or organization we’re dealing with. Idea, platform, individual: that’s the trust stack. Botsman examines each layer in detail. To trust a new idea, like getting into a car with a complete stranger, Botsman says it must be “strangely familiar.” (Or, to use another term I like, it must be an “adjacent possible.”) For example, ride hailing services like Uber and Lyft are really just like taxis but without their corporate shell. If the driver showed up on a horse, or on a drone, it would be a much more difficult leap. We need to see benefits such as cost savings or convenience. And we need some degree of certainty that we’ll actually receive those benefits. Are there guarantees, warranties, regulations or other mechanisms in place to reduce risk? Lastly, we often want to know who else might have made the trust leap. Are any of our friends using the new product or service? What about experts, celebrities or other influencers? OK, you’ve accepted the idea of getting into a car with a complete stranger despite your parents’ dire warnings. Now what about the practicalities? How does it actually work? This is where we need to trust the platform, the systems that actually deliver the idea. We need to know who’s responsible when something goes wrong. Who do we complain to if our driver never shows up? What happens if there’s a crash while we’re in the car? Do the operators of the platform run their business ethically and transparently? Finally, we need to trust the specific individual we’re dealing with, in this case the driver of the car that’s come to pick us up. What we’re looking for, Botsman says, is competence, reliability and honesty. When we meet someone in person for the first time, we try to assess these qualities, that is, we make trust judgements based on a variety of signals: their appearance, their clothing (uniform, lab coat, badges and insignia, etc. ), who they’re associated with (affiliations, alma mater) and mutual acquaintances. There are online equivalents of these signals too, like ratings and reputation, and social graph proximity. In fact, that’s one of the main functions of the platform; to aggregate huge amounts of data to help us make these trust decisions. You could say that trust and reputation are emergent properties of this data. The success of online platforms like Uber and Airbnb, and the reputation systems they’re built on, have enabled the shift to distributed trust. In the last few chapters of the book Botsman looks at some of the trust issues around leading edge technologies like artificial intelligence, chatbots, and the blockchain. Take self-driving cars for example. As they get smarter and more capable, Botsman points out that they evolve from doing things for us to deciding things for us. Can we trust their decision-making? It’s one thing to trust the car when it picks one route over another to avoid traffic backups. It’s another thing entirely when the car decides to swerve into a ditch, possibly injuring you in the process, in order to avoid hitting a pedestrian who’s just run into the middle of the road. How is the AI in the car making these ethical or moral choices? What values or biases are embedded in their algorithms and programming? And who were the people responsible for selecting those values or biases? What other information do we need to know about the algorithms, designers and programmers in order to make a trust leap? Oh, and one more tiny little thing: who’s liable if the car makes the wrong decision? These questions are becoming increasingly urgent as AI technologies spread into more products and more areas of our lives. Kudos to Rachel Botsman for raising them in Who Can You Trust? Who Can You Trust? is a timely book about a critically important topic. I’m probably not a typical reader because I work in the area of internet security and I’m quite familiar with many of the technologies and issues around online trust. Perhaps that’s why I found the book frustrating and disappointing. Rachel Botsman handles most of her subject quite well. She does a great job describing how we make trust leaps by climbing the trust stack. And she traces the evolution of trust from local to institutional to distributed in clear language. Her description of the concepts and technology behind the blockchain were confusing, but I’ll overlook that because the blockchain is definitely not “strangely familiar” for most of us. The best and most important part of the book are the issues I’ve noted above that she raises in the final chapters. Her definition of trust, “a confident relationship with the unknown”, sounds grand and all-encompassing. But I don’t think it’s very useful. Too vague. I prefer the definition from a book called The Thin Book of Trust, by Charles Feltman. He says trust is “choosing to risk making something you value vulnerable to another person’s actions.” I think this does a better job capturing what’s at stake in a trust decision and the fact that trust decisions are highly contextual. Of course, this definition needs to be broadened to include the actions of machines, systems and platforms as well as people. My main complaint about the book is that at just over 250 pages it’s about twice as long as it needs to be. Each idea in the book is illustrated with lengthy examples complete with largely irrelevant biographical details of the people involved. I didn’t need to read Alibaba founder Jack Ma’s life story in order to understand his overriding concern for the reputation of his brand, for example. And I couldn’t care less what kind of tea the author was served while interviewing this or that expert. It’s one thing to provide brief character sketches to bring dry technical details to life or to humanize complex stories. But there’s so much of this padding in Who Can You Trust? that I found myself becoming annoyed at the distractions impeding me from getting to the important ideas of the book. I think you can learn most of what’s contained in the book by watching the two TED Talks listed below, and in much less time. Tonight’s rare “super blood wolf moon” lunar eclipse coincided with an equally rare clear January night in Seattle. My little point-and-shoot digital camera didn’t do it proper justice, but it gives you an idea of what we saw. Eclipses are transcendent events. First and foremost, they’re beautiful. I love the coppery glow of the moon set against a backdrop of stars. Eclipses teach us humility. They remind us that no matter what’s happening in our lives, no matter the hustle and bustle or the trials and tribulations, the universe is unfolding at its own stately, majestic pace, just as it should. I find this comforting. Eclipses were one of the first phenomena to attract our attention to the night sky. And what a powerful attraction they have been! The prediction and explanation of eclipses has been a driving force in astronomy since ancient Greece. Ptolemy, Copernicus, Galileo, Kepler, Newton, all of them contributed to our knowledge of the universe by working to improve our ability to predict eclipses. Finally, eclipses remind us how far we still have to go. Yes, we have binoculars and telescopes to bring images of an eclipse closer to home. And yes, we’ve put a few men on the Moon and even sent a couple of tiny spaceships beyond the solar system. But we have yet to venture beyond our own Earth to the stars. Brené Brown’s latest book, Dare to Lead: Brave Work, Tough Conversations, Whole Hearts, is about courage. The book is pitched towards managers and executives to help them build the courage they need to lead their organizations. But I think the book could just as easily have been called Dare to Live because it applies to many aspects of our lives. Brené Brown is a research professor in social work at the University of Houston. She’s spent about twenty years researching vulnerability, shame, courage and empathy. I first heard of her when I saw her 2010 TED Talk, The Power of Vulnerability. Dare to Lead builds on several of her earlier books including Daring Greatly and Rising Strong, and on seven years of research into courage and leadership. Leadership isn’t about power, or titles or promotions. It’s about courage. I’ll take a brief look at each of these and then circle back to a few themes from the book that I found especially important. The core skill for building courage is the ability to “rumble with vulnerability.” This is such a key concept that I want to unpack its meaning. First, when Brené Brown uses the word “rumble” she’s not referring to some kind of West Side Story street brawl between rival gangs. Rather, it’s a kind of conversation, a tough, potentially contentious and emotionally loaded conversation. One that requires courage and also curiosity and generosity and the will to lean in to vulnerability. It could be about an important business decision, a performance review, or about the division of chores at home. I think a rumble is a lot like the “crucial conversations” described in the book of that name by Kerry Patterson and his associates (book, review). You can’t be courageous without being vulnerable, she tells us. Rumbling with vulnerability, then, is a commitment to having the tough, contentious, emotionally loaded conversations not just in spite of our vulnerability, but fully embracing it. Just over half the book is devoted to learning how to do this. Living into our values, the second skill for courageous leadership, means aligning our thoughts, words and actions with our values. First we have to identify our values. There’s an exercise in the book to help you do this. You’re asked to pick at most two values from a list of about 120. Usually I skip over these sorts of exercises or self-tests but I went through with this one and I’m glad I did. I started by circling about fifteen of the values. I found I could cluster them together pretty easily into just a few groups. For example, I put the values of learning, competence, truth, wisdom, curiosity, and humility together in one group. From each group I then selected the one that I felt was the source or the driver for all the others. In the end I arrived at curiosity and reliability as my two core values. I wouldn’t say the exercise was a great revelation, but distilling the list down to just two values did leave me with some newfound clarity. The next step is aligning our behaviors with our values. There’s another exercise for this: identifying two or three of your behaviors that support or align with your values, and two or three that undermine or wriggle away from them. Our values must be our guiding lights that tell us how to act and lead. When we’re faced with a tough decision, or a tough conversation, it’s our values that should point the way. Living into our values takes courage. We do not always succeed. Brown says that to support us in this work we need help: empathy from one or two people who know us really well, and self-compassion – being generous and caring towards ourselves when we fail or feel inadequate. We can’t rumble with vulnerability if we don’t trust the people we’re rumbling with. If we get even the slightest hint of untrustworthiness, we shut down, raise shields, and put on our battle armor. But what are trust and distrust? Brown uses the definitions from The Thin Book of Trust, by Charles Feltman. In order to trust other people, it’s necessary that we first trust ourselves. So the BRAVING inventory should also be used as a tool to develop self-trust. Last but not least, to build courage we need to know how rise, how to get back up after we’ve fallen. The failures and setbacks we encounter in work and life can be large or small: a project we’re leading misses a deadline; we don’t get the promotion we were hoping for; someone says something snarky at a meeting or at home and we take it personally. Our first reactions are typically emotional and the first step to rising is recognizing that we’ve been triggered, that something has set us off. When that happens we need to get calm and then get curious. To regain calm, Brown recommends breathing, specifically box breathing, a technique used in mindfulness meditation and apparently by Navy SEALs. Then get curious. Talk, or rather rumble, with others to get the answers and fact-check our stories. Start by saying, “The story I’m telling myself is…” That way you’re taking ownership of your stories and you’re asking for help rather than making accusations. Knowing how to get back up helps give us the courage to dare. Brené Brown started her research career looking into vulnerability, shame, and empathy and these themes are woven through Dare to Lead. I think they’re a really important part of the book. I’ve covered vulnerability earlier so I’ll just mention some highlights about shame and empathy here. It’s universal; the only people who never feel shame are sociopaths. Shame is different from guilt and humiliation. Shame makes you feel, “I am bad,” while guilt makes you feel, “I did something bad,” and humiliation is what you feel when something bad happens to you that you didn’t deserve. The opposite of shame and the antidote for shame is empathy. Empathy is the ability to understand the feelings and experiences of others. Ir’s different from sympathy. “Empathy is feeling with people. Sympathy is feeling for them.” Empathy builds trust and increases connection. Brown says that showing empathy to someone helps dispel their shame, but it takes skill. We need to take their perspective, to see the world as they see it. We need to become the learner, not the knower, to truly understand another’s perspective. We also need to be non-judgmental. We have to try to understand the other person’s feelings and communicate our understanding back to them. Okay, so what do shame and empathy have to do with leadership and organizational cultures, the focus of Dare to Lead? Shame drives behaviors like perfectionism, bullying, harassment, blaming and cover-ups that not only contribute to a toxic organizational culture but are also the opposite of daring leadership. It creates an environment where people don’t feel safe, don’t trust each other and cannot rumble with vulnerability. Teaching people empathy skills, on the other hand, builds connection and trust and enables daring leadership. Dare to Lead is a “full stack” book about leadership. It looks at leadership from psychological, behavioral and organizational angles. More broadly, it’s about how to build healthy, trusting, fruitful relationships with others, whether they’re colleagues, friends or family members. I’ve tried to highlight the ideas I found the most important, but I know I need to re-read the book a couple more times to get the most out of it. I really like the central ideas of the book, that leadership requires courage, and courage requires vulnerability. It’s not just the courage to make big, bold bets, or to strike out in new directions. Yes those are important, but the courage Brené Brown is talking about in Dare to Lead is more about the courage to have tough conversations, give clear feedback, hold people accountable, learn from failure and setbacks without blaming, tackle sensitive issues like diversity and harassment, and to do all that in the full knowledge and acceptance of our own vulnerability. Dr. Nadine Burke Harris asks us to think about this scenario early in her book The Deepest Well: Healing the Long-Term Effect of Childhood Adversity. We’ve all had experiences like this, maybe not meeting a bear in the woods exactly, but experiences that make your heart pound and time seem to slow down. It’s a normal, healthy yet primal response to a stressful or threatening situation. You probably know from experience that it can take a while to calm down, for your heart and your breathing to go back to normal. Those stress hormones, adrenaline and cortisol, are powerful and their effects can be lasting. But then Dr. Burke Harris asks, what if you don’t just encounter a bear in the forest? What if the bear lives with you? What if “the bear” is really physical or sexual abuse in your home, neglect or violence or other conditions that make your life hell? You’re going to have that stress reaction, hormones flooding your body, often, perhaps dozens of times a day. The stress will go from tolerable to toxic. As an adult you might be able to cope for a while. But how do children cope under such adverse conditions? How does toxic stress affect our kids? The main point of The Deepest Well is that adverse childhood experiences (ACEs) can dramatically impact health over an entire lifetime. The book is about those impacts, how to recognize them and how to treat them. The term adverse childhood experience comes from a 1998 study by Dr. Vincent Felitti, Dr. Robert Anda and their colleagues which looked at the relationship between traumatic childhood experiences and health outcomes for about 17,500 men and women in the San Diego area. Your ACE score is simply the number of ACEs you experienced before the age of eighteen. ACEs touch people in all levels of society and from all backgrounds. 67% of the US population has at least one ACE and about 12.5% have four or more. Dr. Burke Harris stresses this point because the American culture of individualism can sometimes lead to people being blamed for their health problems. In other words, health problems are sometimes attributed to a person’s own behavioral choices, or neglect, or carelessness, without recognizing that environmental or developmental factors beyond their control can also have significant influence. Neurological: Affecting brain function including cognition, executive function and impulse control leading to learning difficulties and high risk behaviors like smoking, and alcohol and substance abuse. Hormonal: Hormone imbalances contributing to obesity or occasionally stunted growth. Immunological: Unbalanced immune system responses making people more susceptible to colds, flu and other infections, and even to autoimmune disorders such as arthritis, diabetes and celiac disease. One of the most interesting, and maybe controversial, ideas in the book is that ACEs can affect how your DNA is read and transcribed. Exposure to toxic stress doesn’t directly change your DNA, but Dr. Burke Harris says it can impact which parts of your DNA are switched on or off, and therefore impact which proteins are expressed when cells reproduce, and even how cells might function. These impacts are known as epigenetic. Epigenetics, particularly in humans, is a hotly debated topic among scientists, as this article suggests. I can see that it would be advantageous for organisms to have a way to adapt to changes in their environment more quickly that random genetic mutation which takes many generations. Wouldn’t it be great if coral or whales could adapt more quickly to warming oceans, or if trees could adapt to hotter, drier climates? Still, the exact mechanisms by which such impacts are transmitted from parent to child don’t seem to be fully understood yet. Dr. Burke Harris advocates combining both medical and public health approaches to treating childhood adversity. She outlines the medical approach throughout the book when she describes her work at the Bayview Child Health Center, and the Center for Youth Wellness, both in San Francisco. It’s a holistic, multi-disciplinary approach that addresses sleep, exercise, nutrition, mindfulness, mental health and healthy relationships. On the public health front, we’re still in the very earliest stages. Dr. Burke Harris urges early and regular screening for ACEs, for example at a child’s annual check-up. We need more research on ways to reliably detect the biological signs of toxic stress, perhaps through blood tests. And there probably needs to be greater coordination between doctors, schools and caregivers to ensure that children with ACEs are quickly identified and given the proper comprehensive care. The important thing isn’t “overcoming” whatever childhood adversity you may have experienced, but rather understanding the impacts it has had on you, and developing mechanisms to support yourself and the people you love. Most of us understand that our experiences growing up have profound impacts on who we become as adults. Did our parents read to us as kids? Did they encourage us to participate in sports, or get involved in drama club at school, or robotics club? Were they religious or secular, conservative or liberal? 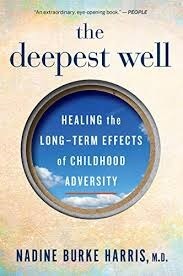 The Deepest Well opened my eyes to the profound ways that childhood experiences can influence not just personality or career choices, but also physical and mental health. The idea of ACEs and their impact is really important, and not just for medical practitioners and caregivers. I think it’s an important tool for self-understanding too. My parents divorced when I was a kid and I probably experienced some emotional neglect growing up, so I’d give myself 2 ACEs. Over the years I’ve come to understand how profoundly those experiences have shaped my life. But I never realized how much they could also be affecting my health. Dr. Burke Harris does a great job throughout The Deepest Well putting a human face on the impacts and the suffering caused by childhood adversity. She presents detailed case studies of several of her patients to illustrate their symptoms and their responses to treatment. The stories are sometimes tragic and hard to read. She also explains technical details well. She takes us on a fascinating tour deep inside the brain, tracing how stress responses are handled by the brain’s various sub-systems. She gives a good introduction to the field of epigenetics, something I’d never heard of before reading this book. My one caveat is about the structure of the book. It’s semi-autobiographical, organized around the story of Dr. Burke Harris’s career. She takes us through her journey learning about ACEs and their impact, about how to care for her patients who have them, and about her work advocating for ACE screening. I was less interested in those parts of the book (sorry, Doctor!). There’s plenty of worthwhile scientific and medical detail throughout The Deepest Well, but if that’s your main interest, as it was mine, then you’ll have to untangle that information from her biography. New York Times article, Can We Really Inherit Trauma?